Dan Shapiro of Glowforge speaks at the 2015 GeekWire Summit. Glowforge is delaying initial shipments of its 3D laser printer again. The Seattle startup, which set a crowdfunding record by raising nearly $28 million from thousands of backers who pre-ordered the printer in October, sent a lengthy email to customers today notifying them that shipments are being pushed back to December 2016. The company’s original plan was to start shipping the “first units” in December, two months after the crowdfunding campaign ended. But in February, Glowforge said those shipments were delayed, telling the initial backers who pre-ordered during the 30-day campaign that they’d now receive their printers this June. Now the shipment is being pushed back another six months. “It’s an awful feeling to let so many people down,” Glowforge CEO Dan Shapiro told GeekWire. Shapiro told backers that a power supply issue is the primary reason for the delay. At the 2015 GeekWire Summit, Glowforge CEO Dan Shapiro showed off a bag he made with the Glowforge 3D laser printer. Due to the delays, Glowforge is offering backers $150 of high-quality free materials designed specifically for lasers; a $50 gift certificate to its design catalog store; and Glowforge “Founder status,” which offers 10 percent discounts on materials and design catalog orders through 2017. One backer recently received a beta version of the printer, which retails for $4,000 (basic level) but sold for $1,995 during the crowdfunding campaign and is available for $2,395 today. Others in the community have organized monthly virtual meetups. Shapiro told backers that they can email support@glowforge.com for a full refund if they don’t want to wait any longer. An example of what you can make with the Glowforge. Photo via Glowforge. Glowforge was founded in 2014 by Shapiro, the brains behind the hit kids board game Robot Turtles — one of Kickstarter’s most successful campaigns ever — and fellow Seattle area startup veterans Tony Wright and Mark Gosselin. The company employs 28 people, up six from this past February, and has job openings for another 19 positions. Glowforge raised a $9 million investment round in May 2015 from Brad Feld’s Foundry Group, True Ventures, and people like MakerBot co-founder Bre Pettis, former MakerBot CEO Jenny Lawton, Wetpaint founder Ben Elowitz, KISSmetrics founder Hiten Shah, director of open source at Google Chris DiBona, and former Swype CEO Mike McSherry. We’ve followed up with Feld and True Ventures for comments on the latest delay, and we’ll update when we hear back. Update: Feld told GeekWire today that he’s not worried at all about Glowforge fulfilling its orders. He said he’s invested in dozens of hardware companies from Makerbot to Fitbit and has seen more projects delivered late than on time. The Glowforge device itself is different from most other 3D printers. Instead of making objects out of plastic strands, it uses a laser to quickly cut and engrave products. Along with smartphone sensors built into the printer, the lasers allow the Wi-Fi-connected device to cut and engrave materials that are curved, uneven, or irregular. Dual cameras also measure the thickness of material to a precision of four one thousandths of an inch. The device lets people use raw materials like leather, paper, plastic, fabric, or cardboard and make products with a push of a button. It has no screens and measures 37 inches wide, 20 inches deep, and eight inches tall. At the 2015 GeekWire Summit, Shapiro showed off a book bag he made with the Glowforge that had the exact dimensions for his laptop and other personal items — all for $58 and six hours of work. You can create “almost anything” with Glowforge, he added, including jewelry, light fixtures, smartphone engravings, wallets, and toys. We have a lot of news. So much so, I’m going to start out with a short summary before I get into the details. We feel terrible about this delay, and by way of apology, we are including $200 of extras. Your Glowforge will ship with $150 worth of Proofgrade™ materials as a free bonus. You will receive a $50 gift certificate to the Glowforge design catalog. You will receive Glowforge Founder status. Your Glowforge Founder status entitles you to a 10% discount on all catalog and materials purchases. You can read beta user reports the forum now. You can see Glowforge printers in action at Maker Faire Bay Area, Seattle, and NYC. I will be answering questions live in our forum all day today, and in a live Q&A tomorrow (Wednesday) at 11:30 AM pacific time. 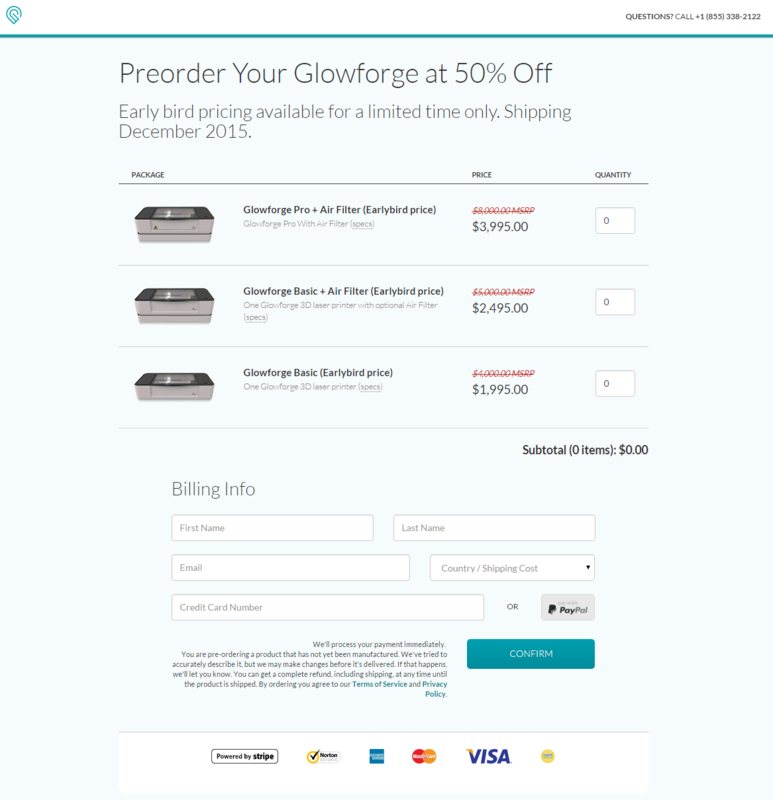 Should you decide that you no longer want your Glowforge reservation for any reason, you may cancel and reverse all charges at any time until your unit ships. If this seems like a long update, well – it is. We heard you loud and clear that we were sending too much email. So as of our last email, we moved regular updates to http://community.glowforge.com and save only big updates for email. Like this one. But first… I apologize. I worked very hard to deliver your Glowforge on time, and I am sorry that I failed you. Our team has been amazing and done everything possible. This is on me. And we know there’s only one thing we can do that’s more important than shipping on time: shipping the incredible product that you deserve. It’s been an intense six months since we completed our crowdfunding campaign, and while there have been many ups and downs, we hit one problem we just couldn’t get past in time – our power supply. Although it was scheduled to be complete in November last year, we’ve only just received units that met our stringent performance, safety, and reliability requirements. For that reason, we’re only now releasing beta units. We could hit the gas and start churning out huge numbers of printers in time to meet June. We would love to do that. We want you to have your printer. It makes us feel terrible to contemplate letting you down. But we’d feel worse about compromising on quality. We just got this power supply. Everything has been working well together, but we haven’t had enough time to feel confident that it will meet your expectations. We have dealt with many surprises along the way, and will doubtless overcome a few more before we’re done. We’re moving our delivery schedule to December because that gives us enough room to guarantee the product is as good as you deserve. We are going to test our builds constantly, ramp production slowly, and deliver your amazing 3D laser printer in December. You believed in us. You made this happen. You’ve stuck with us this long. And that’s why we’re going to do something extra for you. Actually, somethings. We wanted to make sure your Glowforge prints perfectly every time, so we developed a line of materials designed specifically for lasers, called Proofgrade™. We’ve commissioned custom plywood with laser-safe glue and no internal knots, top quality leather tanned without the use of harmful chemicals, and more. While your Glowforge will work with any laser-compatible materials, we’ve created these to offer the very best experience. Proofgrade materials are not just the highest quality – they have special features designed just for your Glowforge. For example, you can draw directly on them. There’s a paper masking applied to the material, with a low-tack laser-compatible adhesive so it’s easy to remove. You may have seen the incredible tracing power of your Glowforge – not only can you design directly with a pen, you can cut the material in half just by drawing a line! The paper masking also protects the material during the print process. It keeps the edges looking crisp and new so your print comes out perfectly. When you’re done, you just peel it off to reveal your perfect print underneath. Alternately, you can peel off some of it, and then paint the material before removing the rest – making it easy to add color and interest to your creation. Best of all, the paper has embedded codes that your Glowforge can read. This is absolutely magical. You may have heard that with lasers, you have to cut and engrave test pieces over and over again to learn the right power and settings, and you have to do it separately every time you use a new material. As you’d imagine, that’s a frustrating, slow, and expensive process. Proofgrade materials do away with all of that. Your Glowforge recognizes the material, automatically configures itself, and prints perfectly. Best of all, Proofgrade materials will be priced competitively with the same types of materials in stores. Wait, no: the best part is that you get $150 worth of assorted hardwoods, veneers, leather, plywood, acrylic, and more, included with your Glowforge at no charge, as a gift for your patience. As you know, we’re going to launch with a design catalog full of amazing designs, ranging from wallets to wall art, purses to picture frames, and dollhouses to drones. No matter how creative you are, it’s always inspiring to see what other artisans have done before. For that reason, we’re giving you a $50 gift certificate to choose your favorite patterns to print. These designs are crafted by experts to work perfectly on your Glowforge. You’ll have a multitude of designs to choose from, so the only question is… what do you want to print first? You probably know that Glowforge has become a phenomenon. We’re backordered for months, and more people are getting in line every day. Ultimately, this is because of you. That’s the reason we’re buying more than $1.5 million of materials for you, why we’re giving you more than $500,000 in catalog gift certificates, and why we’re working so hard to deliver the product you paid for and deserve. You’ll get a 10% discount on all of your Proofgrade™ material orders through 2017. You’ll get a 10% discount when purchasing from our design catalog through 2017. We’ll recognize you as a Glowforge Founder in your profile forever. Prolific forum contributor Josh Kopel is posting up a storm with projects on his beta unit in the “Laser Made” department of the forum. We love this because we can actually see what real customers do with their Glowforge and what they print with it. This is helping us build an even better product for you. If you applied to be a beta tester, we’re still adding new testers to the list – you don’t need to do anything else. If you haven’t applied, you still can right here. Our beta users get a stack of Proofgrade materials to experiment with, too. As much as we try to focus our time on shipping, we love meeting you in person! Even more importantly, we want you to be able to see the machines, ask us questions, and know what you’re going to receive. So while we normally (regretfully) decline invitations to events, we’ve scheduled a few where you can print something on a Glowforge yourself. We’ll be bringing printers to Maker Faire Bay Area (May 18 – 21), Mini Maker Faire Seattle (September 17 – 18), and World Maker Faire New York (October 1 -2), and we hope to see many of you there. We’ll also let you know when we’re planning to host another, larger open house at our new Seattle office sometime this fall. I’m available right now for Q&A. I’ll be in the community forum all day today, along with some of my colleagues, answering questions. (If you need to set up an account to post, you can find instructions here.) I will also host a live Q&A tomorrow (Wednesday) at 11:30 AM Pacific time. Check the Announcements section of the forum at 11:30 and look for “April 2016 Q&A with Dan”. Should you decide that you no longer want your Glowforge for any reason, you may cancel and reverse all charges at any time until your unit ships. I know you didn’t make the decision to pre-order your Glowforge lightly, and you’re eagerly awaiting the day a (very large) box arrives on your doorstep. But I also understand if you can’t wait any longer. We want what’s right for you. We’d rather have you as a happy customer some time in the future than an unhappy customer right now. Just reply to this email if you need to cancel, and we’ll take care of it right away. We owe you a debt of gratitude and thanks. It’s not everyone who can see the potential in a tool that the rest of the world can barely imagine existing. Together, we’re a ten-thousand-strong community of creators who will astonish the world with what we can do. We cannot wait until the day when we deliver your Glowforge to you.